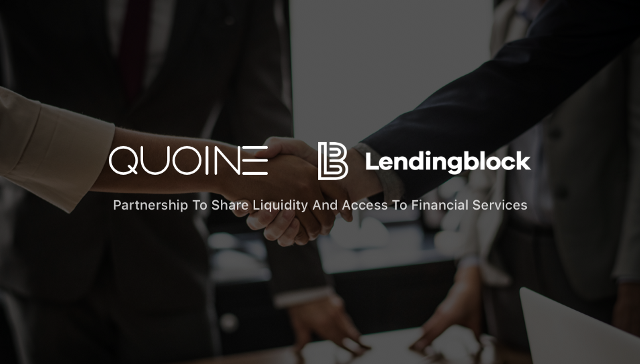 Global fintech company QUOINE, owner of digital asset exchanges QUOINEX, QRYPTOS and the forthcoming LIQUID platform, joins Lendingblock’s Institutional Advisory Group and becomes liquidity provider. London, 26 June 2018 - Lendingblock, the institutional platform for collateralised digital asset lending, has formed a partnership with global fintech company QUOINE. The partnership will see the QUOINEX and QRYPTOS exchanges, as well as the LIQUID platform later, integrated with the Lendingblock platform to facilitate the sharing of liquidity, and also extend borrowing and lending to exchange users. QUOINE will join Lendingblock’s Institutional Advisory Group and list Lendingblock’s LND token on QRYPTOS and LIQUID. QUOINE is a leading global fintech company that provides trading, exchange, and next generation financial services powered by blockchain technology. With offices in Japan, Singapore and Vietnam, QUOINE combines a strong network of local partners with extensive team experience in banking and financial products to deliver best in class financial services for its customers. More information is available at quoine.com. Lendingblock is a digital asset lending exchange platform for fully collateralised cryptocurrency loans, linking institutional borrowers and lenders. It is the first company to bring cross-blockchain lending to the crypto world. More information is available at lendingblock.com.